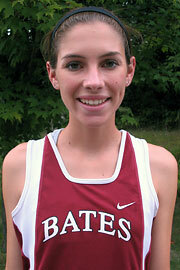 Led by first-year standout Liz Schulze (San Diego, Calif.), the Bates College women’s cross country team defeated rival Bowdoin 90-127 in a dual meet hosted by Bates Saturday at Pineland Farms. Schulze ran out to the head of the pack and built a healthy lead, ultimately winning the 5-kilometer race in a time of 19:38, 14 seconds ahead of runner-up Lindsay Hodge of Bowdoin. It was her second win in as many races for Schulze, who also cruised to first place in the women’s First-Year/Sophomore race the weekend before at the Colby Class Wave Relays. Bates, ranked No. 9 in New England, next competes at the Codfish Bowl Saturday at Boston’s Franklin Park at 11 a.m.